A plugin that can literally save you hours of manual work on your Amazon affiliate sites! I’ve personally been an Amazon associate since 2008. I’ve built very successful sites that promote products that appear on Amazon.com and .co.uk, and have sold too many to remember. The one tool that is the first I download and add to any new Amazon affiliate niche site is EasyAzon. EasyAzon is a premium plugin that literally can save you hours of your busy life. 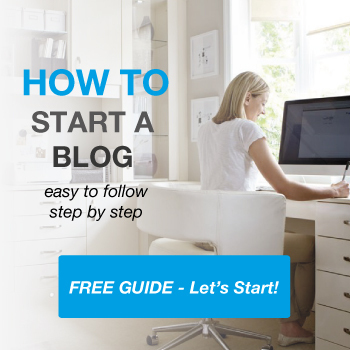 Before EasyAzon, I would have to link manually to Amazon products, having one screen open in my WordPress dashboard and the other logged into my Amazon associates account, manually generating shortcodes of the products I want to promote on my site. The whole process of adding Amazon links, CTAs and images is the most tedious thing in the world. With EasyAzon, you I can literally do a task that would have taken 5 minutes to do, in just 30 seconds. There’s no multiple tabs open on my browser. I can do it all from my WordPress dashboard, which is an absolute time saver and general life hack! 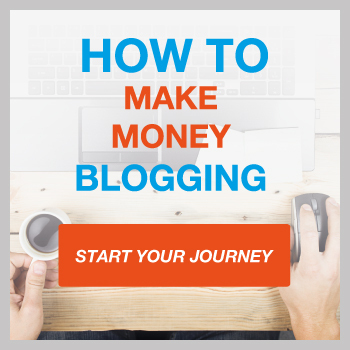 What make EasyAzon an Affiliate Marketer’s Dream? As an Amazon associate with over 50 Amazon affiliate sites under my ownership, EasyAzon is a tool that not only saves me time, but enables me to use that time saved to do more important work such as promoting my websites, building links and creating more quality content. I this section I will go through the main benefits and features of the EasyAzon plugin and show you how you can increase your Amazon affiliate earnings with this awesome tool. I hate having to drive into my websites’ code simply to add in a link or to “nofollow” a link or image. – automatically localize affiliate links. What I mean by this is the ability to override the default settings that you’ve set in your EasyAzon settings. Sometime you might what to assign an Amazon link with a pop-up feature or an info block. This can be done within the individual page that you want to place an Amazon link into. 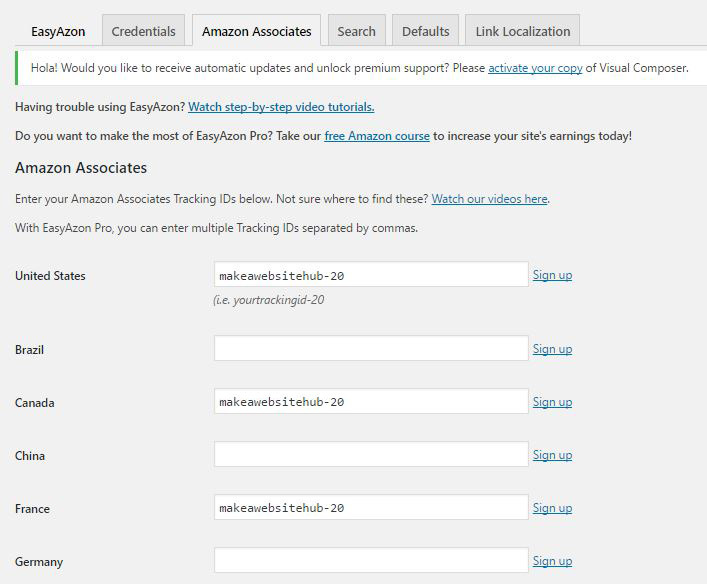 With EasyAzon, you can have your Amazon affiliate links automatically change to whatever location your visitor is viewing your site from. Normally you would only able to get commission from just Amazon.com. But now with EasyAzon, you can get commission from all over the world. For example, if you have lots of traffic from Canada, you can then set that traffic to go to your Amazon.ca affiliate links. This means that you can potentially earn additional cash from other local versions of Amazon without having to delve into code or set up custom redirects. It’s all done for you. I installed this across all my Amazon sites, and it earned me well over $6k in the first month by grabbing up the local commission from Amazon sites in the UK, Germany, Canada and France. To take advantage of this feature you will need to sign up to the different local Amazon versions and insert your tracking id into EasyAzon. EasyAzon gives you multiple linking options. 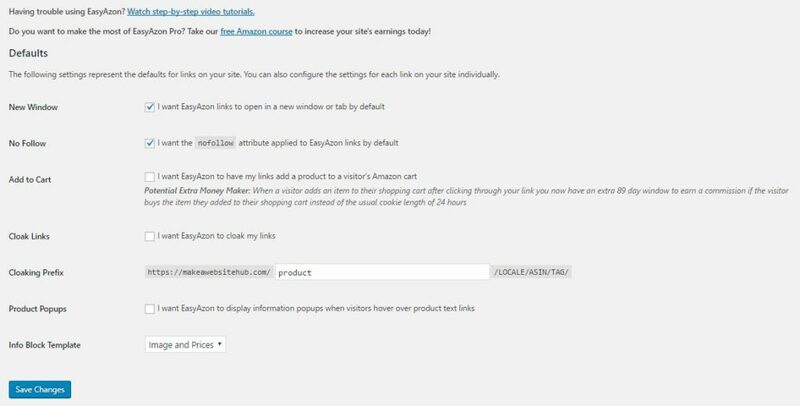 EasyAzon have 6 pre-built CTA buttons that you can use with your EasyAzon Amazon links. Here are all 6 examples. They come in either white or orange and have 3 sizes to choose from, tall, wide and small. Info blocks are static blocks of information with a CTA button, image and prices. You can control what is shown in these info blocks by setting the default settings in the EasyAzon defaults section. As with all the different link options that you have above, EasyAzon provides you with the flexibility to change the links as you wish. You can customize them on a individual basis ( within different posts / reviews ) or you can simply set your default link settings on the plugin settings page in your WordPress dashboard. For example, you can set your defaults to add in a mouseover pop up to all links, open all links in a new window and select “nofollow” for all links. However, when you insert the individual links to a certain page, EasyAzon gives you have the option to override your defaults, so you have the flexibility to create bespoke links with bespoke settings. This is probably my favourite feature. EasyAzon gives you the option of turning your link into an “Add to cart” function for the user. The customer can click on your link and it will add the item to the their cart. Once this is done, it will gives you a full 90 days cookie. So you will get commission on any sale made within 90 days. The normal link without the “Add to Cart” option will only give you commission on any product that’s purchased in a 24 hour period. You can actually toggle this function on/off for the whole site or set it for individual links. 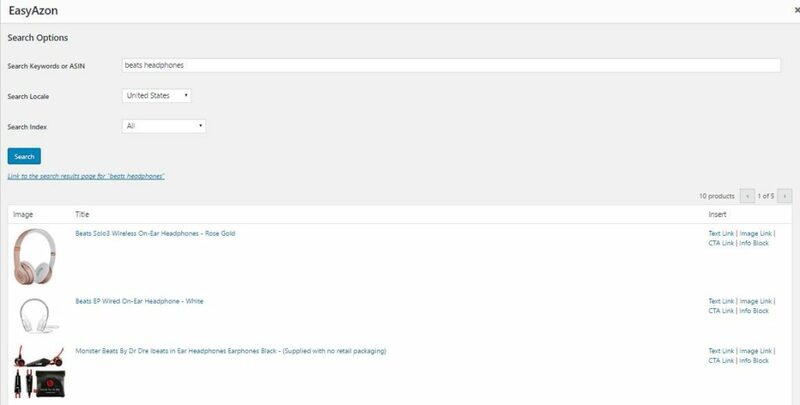 You can enable product pop ups to appear when a user moves the mouse over a product link. This is quite useful to grab the users attention as well as providing them with additional information. This often leads to more click throughs, which potentially means more commission. 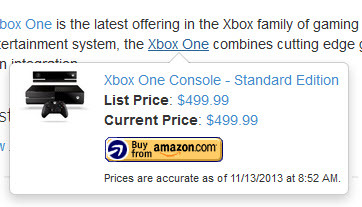 Above shows exactly what happens when a user moves their mouse over an EasyAzon Amazon link. The information in that box can be just enough for the user to click through and purchase that product. I think the ease at placing in links is what I like the most about EasyAzon. You simply highlight the text you want to link from and press the EasyAzon button which is just next to the Add Media button at the top of your dashboard. It’s from here that you can click on what link you want to place. Below I have selected to add in an image links. 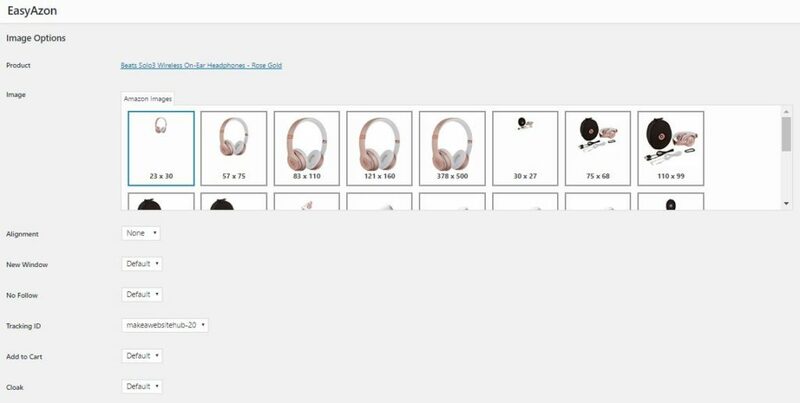 EasyAzon then gives you all the image options from Amazon for that particular product! Awesome! This makes adding in Amazon images a joy rather than a chore. EasyAzon doesn’t run on php7, so if you have the option of upgrading to php7 with your server provider, you can’t do it until EasyAzon upgrades. 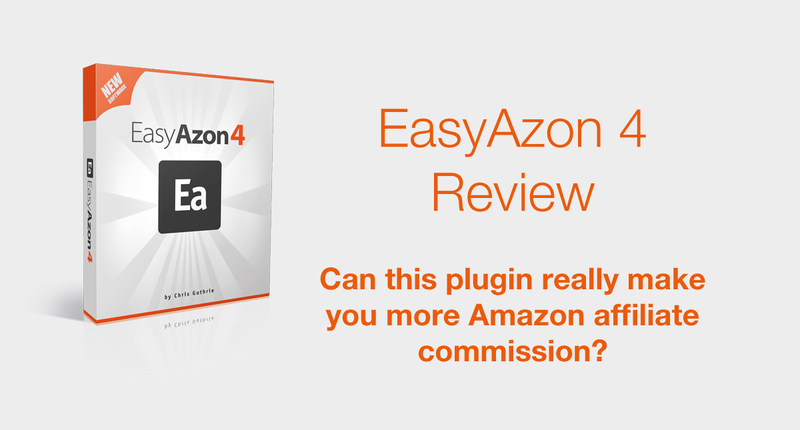 Verdict on EasyAzon – Can it really make you more Amazon affiliate money? I’ve been using EasyAzon for 3 years now, and it has made a massive difference to my Amazon affiliate income. As I mentioned earlier in this review, it earned be an extra $6k in the first month, just by giving me the ability to tap into the different Amazon territories and earn commission from those clicks. Not everyone will earn an extra $6k in the first month, as not many people have the number of sites I do, so do bear that in mind. But let me just say this, EasyAzon will definitely help to bring in additional revenue from Amazon. It’s not a perfect plugin, but it’s damn close. If they would just upgrade the plugin to PHP7 and maybe add the functionality to add more than one image and place it in a HTML5 slideshow and perhaps give users the options to insert ALT tags into images, then the plugin would be incredible. I hope that the information I’ve given you today has helped you make the right decision to whether EasyAzon can help you with your Amazon associate websites and make you even more money with their various features. As I’ve said before, EasyAzon for me has made the difference both in time saving and in generating a lot more income from my Amazon sites, and I would definitely recommend that you get this plugin before the prices go up! It really is the only plugin to help you successful Amazon associate sites. If you’re still not sure about EasyAzon and how it can help you with your Amazon sites, then head over to the video from the creator of EasyAzon, Chris Guthrie. In the video, Chris will go through all the features of EasyAzon and show you exactly how it works and how it can help you generate more income from your Amazon sites without too much work. What a great article for review plugin in EasyAzon. Thanks Jamie. Does this integrate well with tables? Yes it does. I just copy and paste the easyazon amazon codes into Tablepress. You can use the EasyAzon table plugin TableAzon, but I don;t think its as good as Tablepress. is it one time license or monthly fee? Does this only work on WordPress or can us use it on other sites like Wix or SquareSpace? Unfortunately you can only use it on WordPress sites, as its been developed as a WordPress plugin. Great review! If a product isn’t listed on a visitor’s local Amazon site, is it possible to set its default country on a per link basis, rather than the default being site-wide? If not, do you know of any other affiliate plugins that allow for this? No this isn’t possible. I would check out Amazon’s one-link functionality. Although it doesn’t cover all countries just yet. Easyazon though is by far better. I wouldn’t worry too much about one product not being listed on a person’s local amazon, as more than likely they will find something else and you’ll still get the commission.